listen), literally "Bremen's harbour", Low German: Bremerhoben) is a city at the seaport of the Free Hanseatic City of Bremen, a state of the Federal Republic of Germany. It forms an enclave in the state of Lower Saxony and is located at the mouth of the River Weser on its eastern bank, opposite the town of Nordenham. Though a relatively new city, it has a long history as a trade port and today is one of the most important German ports, playing a crucial role in Germany's trade. The town was founded in 1827, but settlements, such as Lehe, were in the vicinity as early as the 12th century, and Geestendorf, which was "mentioned in documents of the ninth century". These tiny villages were built on small islands in the swampy estuary. In 1381, the city of Bremen established de facto rule over the lower Weser stream, including Lehe, later therefore called Bremerlehe. Early in 1653, Swedish Bremen-Verden's troops captured Bremerlehe by force. The Emperor Ferdinand III ordered his vassal Christina of Sweden, then Duchess regnant of Bremen-Verden, to restitute Bremerlehe to Bremen. However, Swedish Bremen-Verden soon enacted the First Bremian War (March to July 1654) and in the following peace treaty (First Stade Recess (Template:Separated entries); November 1654) Bremen had to cede Bremerlehe and its surroundings to Swedish Bremen-Verden. The latter developed plans to found a fortified town on the site, and much later this location became the present-day city of Bremerhaven. In 1672, under the reign of Charles XI of Sweden, in personal union Duke of Bremen-Verden—colonists tried unsuccessfully to erect a castle (named Carlsburg after Charles XI) there; this fortified structure was meant to protect, as well as control shipping heading for Bremen. Finally, in 1827, the city of Bremen under Burgomaster Johann Smidt bought the territories at the mouth of the Weser from the Kingdom of Hanover. Bremen sought this territory to retain its share of Germany's overseas trade, which was threatened by the silting up of the Weser around the old inland port of Bremen. Bremerhaven (literally in English: Bremener Haven/Harbour) was founded to be a haven for Bremen's merchant marine, becoming the second harbour for Bremen, despite being 50 km (31 mi) downstream. Due to trade with, and emigration to North America, the port and the town grew quickly. In 1848, Bremerhaven became the home port of the German Confederation's Navy under Karl Rudolf Brommy. The Kingdom of Hanover founded a rival town next to Bremerhaven and called it Geestemünde (1845). Both towns grew and established the three economic pillars of trade, shipbuilding and fishing. Following inter-state negotiations at different times, Bremerhaven's boundary was several times extended at the expense of Hanoveran territory. In 1924, Geestemünde and the neighbouring municipality of Lehe were united to become the new city of Wesermünde, and in 1939 Bremerhaven (apart from the overseas port) was removed from the jurisdiction of Bremen and made a part of Wesermünde, then a part of the Prussian Province of Hanover. As possibly the most critical North Sea base of the Nazi War Navy, the Kriegsmarine, 79% of the city was destroyed in the Allied air bombing of Bremen in World War II; however, key parts of the port were deliberately spared by the Allied forces to provide a usable harbour for supplying the Allies after the war. All of Wesermünde, including those parts which did not previously belong to Bremerhaven, was a postwar enclave run by the United States within the British zone of northern Germany. Most of the US military units and their personnel were assigned to the city's Carl Schurz Kaserne. One of the longest based US units at the Kaserne was a US military radio and TV station, an "Amerikanischer Soldatensender", AFN Bremerhaven, which broadcast for 48 years. In 1993, the Kaserne was vacated by the US military and returned to the German government. In 1947 the city became part of the federal state Free Hanseatic City of Bremen and was consequently renamed from Wesermünde to Bremerhaven. Today, Bremerhaven is therefore part of the city-state of Bremen, being to all intents and purposes a state comprising two cities, while also a city in its own right. This is complicated somewhat by the fact that the city of Bremen has owned the "overseas port" within Bremerhaven since 1927. To further complicate matters, a treaty between the two cities (as mentioned in Section 8 of Bremerhaven's municipal constitution) makes Bremerhaven responsible for the municipal administration of those parts owned directly by Bremen (known as stadtbremisch). 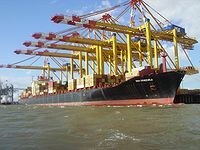 The port of Bremerhaven is the sixteenth-largest container port in the world and the fourth-largest in Europe with 4.9 million twenty-foot equivalent units (TEU) of cargo handled in 2007 and 5,5 million in 2015. The container terminal is situated on the bank of the river Weser opening to the North Sea. In the wet dock parts, accessible by two large locks, more than 2 million cars are imported or exported every year with 2,3 million in 2014. Bremerhaven imports and exports more cars than any other city in Europe. Another million tons of "High-and-Heavy" goods are handled with ro-ro ships. In 2011 a new panamax-sized lock has replaced the 1897 Kaiserschleuse, then the largest lock worldwide. Bremerhaven has a temperate maritime climate; severe frost and heat waves with temperatures above 30 °C (86 °F) are rare. On average, the city receives about 742 mm (29.2 in) of precipitation distributed throughout the year, with a slight peak in the summer months between June and August. The hottest temperature ever recorded was 35.8 °C (96.4 °F) on 9 August 1992, and the coldest was −18.6 °C (−1.5 °F) on 25 February 1956. Due to its unique geographic situation, Bremerhaven suffers from a few transportational difficulties. The city has been connected to the autobahn network since the late 1970s. The A 27 runs north-south, east of the city, connecting Bremerhaven to Bremen and Cuxhaven. Road connections to Hamburg, however, are poor. The Bundesstraße 71 and secondary roads therefore carry most of the heavy lorry traffic. A proposed solution is the construction of the A 22, the so-called Küstenautobahn (or "coastal motorway"), which would link Bremerhaven to Hamburg and Wilhelmshaven/Oldenburg (using the Weser tunnel). Roads leading to the overseas port are regularly overloaded with freight traffic, and solutions are presently being discussed, including a deep-cut road favoured by the city government and various interest groups. Bremerhaven has three active passenger rail stations, Bremerhaven Hauptbahnhof in the city centre, Bremerhaven-Lehe north of the centre and Bremerhaven-Wulsdorf in the southern part of the city. A fourth station, Bremerhaven-Speckenbüttel near the border to Langen has been out of service since 1988, though it might reopen when the Bremen S-Bahn scheme becomes operational. Bremerhaven's central station lost its last long-distance train in 2001. Now only regional connections to Bremen, Cuxhaven, Osnabrück and Hannover are available. The railways in Bremerhaven, however, still carry a heavy load of freight traffic, mostly new cars, containers and food. Panoramic view to Bremerhaven from Bremerhaven Radar Tower. On the left side the city including Columbus-Center are some tourist attractions and the de:Havenwelten just under construction. Bremerhaven has only a few historical buildings, and the high street and city centre are almost entirely post-war. The main attractions for tourists are found at the Havenwelten and include an attraction about climate change, the Klimahaus Bremerhaven 8° Ost, the German Emigration Center (since August 8, 2005) and the German Maritime Museum (Deutsches Schiffahrtsmuseum) by Hans Scharoun from 1975, featuring the Hansekogge, a vintage cog dating from 1380, excavated in Bremen in 1962, and the historical harbour (Museumshafen) with a number of museum ships, such as the Type XXI U-boat Wilhelm Bauer (a museum of its own), the Seute Deern (a wooden three-masted sailing vessel), and the salvage tug Seefalke from 1924. The Bremerhaven Zoo reopened on 27 March 2004, after a lengthy renovation. It features Arctic wildlife, both terrestrial and marine. The latest addition is the Klimahaus from 2009, simulating travel adventure along the 8th line of longitude and dealing with climate issues. Two gazebos can be found on top of the Atlantic Hotel Sail City and the Radar Tower. Another tourist spot is the Fischereihafen (fishing port) in Geestemünde which also houses an aquarium (the Atlanticum). The Lloyd-Werft shipyard is renowned for building and renovating large cruise liners, for example Norway. Every five years Sail Bremerhaven is held, a large sailing convention that attracts tall ships from all over the world. The last time it was held was in 2015 with over 270 vessels and 3,500 crew members. In 2011 Bremerhaven set the record for the largest ever parade of boats, with 327 vessels in the parade. This record was broken in 2012 by the Thames Diamond Jubilee Pageant, with 1,000 boats. The passenger terminal Columbuskaje, built at the Weser bank in 1927 to avoid time-absorbing locking, has been transferred into a cruise terminal (Columbus Cruise Center Bremerhaven/CCCB). Also three marinas are available, the latest accessible through a new lock at Neuer Hafen. Bremerhaven has a city council with 49 members. The Fischtown Pinguins, also known as REV Bremerhaven, are a professional ice hockey team in the DEL, Germany's top ice hockey league. Eisbären Bremerhaven (Polar Bears), founded 2001, is a basketball team playing in the 1st division of the Basketball Bundesliga. Bremerhaven is home to the Alfred Wegener Institute, a national research institute which is concerned with maritime sciences and climate and keeps a number of research vessels, amongst them the heavy research icebreaker RV Polarstern. It also runs the Neumayer-Station III in the Antarctic. The Fraunhofer Society Institute for Wind Energy and Energy System Technology (German Wikipedia) maintains research laboratories in Bremerhaven for development and testing of Wind Power components. The German Maritime Museum is part of the German Leibniz Association. The Bremerhaven University of Applied Sciences/Hochschule Bremerhaven (The word Hochschule literally means a high school) was founded in 1975 and is expanding since with more than 3.000 students in 2009. The university is attended by a large number of overseas students from all over the world. Among the courses offered are Process Engineering and Information Technology. In addition to that there are also streets which earlier had been named after Szczecin (Stettiner Straße) and Kaliningrad (Königsberger Straße). Lale Andersen (1905–1972), German singer and actress, sang WW2 song "Lili Marleen"
Carola Höhn (1910 in Geestemünde – 2005) a German stage and movie actress. Hans Joachim Alpers (1943–2011), German writer and editor of science fiction and fantasy. André Werner (born 1960) German composer of classical music. ^ "Bevölkerungsstand und Bevölkerungsbewegung (monatlich)" (in German). Statistisches Landesamt Bremen. 30 April 2012. http://www.statistik-bremen.de/aktuelle_statistiken/01b.htm. ^ Archives, The National. "The National Archives - World War II - Western Europe 1939-1945: Hamburg - Why did the RAF bomb cities?". http://www.nationalarchives.gov.uk/education/worldwar2/theatres-of-war/western-europe/investigation/hamburg/sources/docs/6/. Retrieved 20 March 2018. ^ Verfassung für die Stadt Bremerhaven (VerfBrhv Script error); § 8(1) Zum Stadtgebiet gehören alle Grundstücke, Fluß- und Hafenanlagen der ehemaligen Stadt Wesermünde. Gemeindeverwaltungsmäßig wird die Stadt Bremerhaven im Gebiet des stadtbremischen Überseehafens aufgrund eines Vertrages zwischen den Städten Bremen und Bremerhaven zuständig. ^ Van Marle, Gavin (2008-01-31). "Europe Terminals stretched to limit". Lloyds List Daily Commercial News: pp. 8–9. ^ "weser.de – Seehäfen & Seeschifffahrt: Bremische Häfen". http://www.weser.de/index.php?id=29. ^ "Wetter und Klima – Deutscher Wetterdienst – Startseite". http://www.dwd.de/bvbw/appmanager/bvbw/dwdwwwDesktop?_nfpb=true&_pageLabel=_dwdwww_klima_umwelt_klimadaten_deutschland&T82002gsbDocumentPath=Navigation/Oeffentlichkeit/Klima__Umwelt/Klimadaten/kldaten__kostenfrei/ausgabe__mittelwerte__node.html?__nnn=true. ^ a b "Indices data". http://www.ecad.eu/download/millennium/millennium.php. Retrieved 20 March 2018. ^ "SAIL – Bremerhaven". http://www.sail-bremerhaven.de/. ^ "Diamond Jubilee Thames Pageant cheered by crowds". BBC News. 3 June 2012. https://www.bbc.co.uk/news/uk-18312403. Retrieved 4 June 2012. ^ "National Commission for Decentralised cooperation" (in French). Délégation pour l’Action Extérieure des Collectivités Territoriales (Ministère des Affaires étrangères). http://www.cncd.fr/frontoffice/bdd-region.asp?action=getRegion&id=4#tabs3. Retrieved 2013-12-26. ^ "Kontakty partnerskie Miasta Szczecin" (in Polish). Urząd Miasta Szczecin. Archived from the original on 2012-08-18. https://web.archive.org/web/20120818001351/http://bip.um.szczecin.pl/umszczecinbip/chapter_11296.asp. Retrieved 2013-07-29. Wikivoyage has a travel guide for Bremerhaven. Wikisource has the text of the 1911 Encyclopædia Britannica article Bremerhaven. This page uses content from the English language Wikipedia. The original content was at Bremerhaven. The list of authors can be seen in the page history. As with this Familypedia wiki, the content of Wikipedia is available under the Creative Commons License.